A higher angle on top bevel gives this saw an extra sharp shearing action to slice through single or double-sided laminates without chipping. 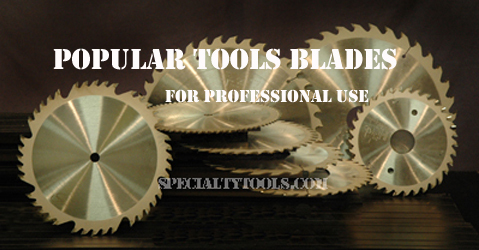 These blades are good for laminates, melamine, coreboard, and other composite materials. Made with Micro-Sheen C-4 sub-micron carbide for longer life. HATB - High Alternate Top Bevel. Similaar to ATB, but the teeth are ground with a sharper top angle. This is used for laminates such as melamine and formica. This design will allow chip free cutting of laminates on most materials. TCG - Triple Chip Grind. Alternating triple-edge and flat top for dual action cutting. Triple-edge teeth chip down the center of the kerf, flat top raker teeth follow to clean out the material from both sides, extremly resistant to wear and fracture when cutting hard or abrasive material.